Earn $1.34 in VIP credit (134 points)What's This? Step up your puncture protection without the extra weight. The Ultra Lite Tire Liners create a protective barrier along the inside of your tires, preventing inner tube punctures caused by sharp objects like thorns and broken glass. Thanks to their top-secret new construction, the Ultra Lite design is considerably lighter than Mr. Tuffy's standard liners -- a significantly lighter option than messy self-sealing and bulky thorn resistant inner tubes. This updated design is also even easier to install thanks to the curve fit system, and completely re-useable. Sold in pairs (enough for one bicycle). Made in the U.S.A. Choose the color which corresponds to your tire size. I added these when I purchased my last set of Continental Gator Hardskins, I replaced my rear times after about 4000 miles did not replace the front tire, have gone another 2000 without any puncture related flats. Previously using just Continental Gatorskins I had gotten 4 - 6 punctures in 4000 miles. I'm a daily commuter and have been riding over the same terrain which has helped me to compare. I think you could purchase any tire you like and add Mr. Tuffy and be pretty much puncture free. They will pay for themselves with your reduced purchases of tubes, CO2 if you use it or patch kits. Don't forget the reduction of repair time and frustration and the added confidence you having with Mr. Tuffy. The widest Tuffy made is just over an inch wide. Useless on a 2.0 to 2.5 MTB tire, as it would leave almost half the tread area exposed to punctures. Shame on Mr. Tuffy for false advertising. 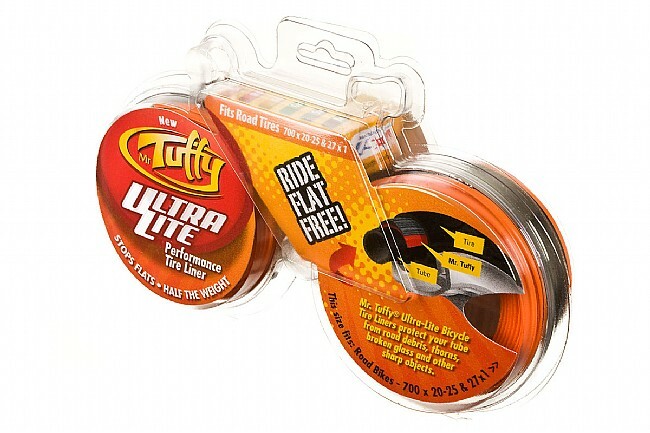 I use the Mr. Tuffy Ultra Lite Tire Liner in my tires and they work great. The liners are very durable. I haven't got a flat since I installed them. My only reservation about them is the width. If they were wider, they would cover more of the inner tube from the sides, preventing angled punctures. Otherwise, the liners work great, protecting my tubes from damage. I ride to work located in an Industrial Park. It is an exception if I don't encounter glass or steel pieces on the road. This gives me the confidence to keep riding in spite of the hazards. My favorite tiretube combination is the Michelin Pro 234 Race tire and Michelin A1/B1 Aircomp Tube. However, these tires and tubes don't fair well where I live and ride. I had to constantly change tubes on my rides, which made it a burden. After my third puncture in 2 rides, I had to do something. I researched all the available extra tire protection on the market and decided this was the best option. I read all the previous reviews and everyone seems to like this product. The installation was quick and easy, most likely will add another 3-5 minutes to changing out your tube. I viewed how to correctly install the product on YouTube. You will only have to do this once per wheel. I was a little worried that it would add weight and rolling resistance. Unless you are ultra sensitive to these things, you will not know the difference. So far, I've been on five 60 miles rides and the product works as advertised. Hopefully, changing tubes on the side of the road is a thing of the past. Keep in mind, this product add extra protection for your tire and tube. I recommend inspecting your tires before and after every ride (a 1 minute exercise). Went 20 feet on a track trail that had thorns and it provided zero protection. Had 4 holes! I'm using a sleek tires on painful roads of Metro Manila, never gets flat, that's peace of mind!!! We had a chronic problem with flat tires until we installed these liners combined with puncture resistant tubes. No more flats! Best tire liner I have ever used. Easy to install and works as advertised. Easy to install and works as advertised and priced appropriately. I bike in Colorado, and there is no end of hard, spiny seeds that flatten tires. Before I started using these liners, I could hardly go out on a ride in the fall without picking up at least one flat, sometimes two at a time. I've been using these things for over 20 years, and flats are a thing of the past. No matter what other option is available for puncture resistant tires or tubes, I think this is the best choice. I never consider the puncture resistence of tires when I replace them and use the cheapest tubes I can find. A set of these pays back many multiples of the cost in replacement tubes. Been using Tuffys for years on my road bike, my girlfriends road bike and our tandem. Haven't had a flat in years. Just be sure to change your tubes at least once or twice because these little babies will out last the tube. Put 'em in my Mtn Bike. I've fixed my share of flat tires - no more! I had always heard tire liners added a lot of weight and were hard to install. Boy were those folks misinformed. It's just the opposite. I installed them a month ago on a fixed gear bike in less than 10 mins. and haven't had a flat yet. There isn't any noticeable change in anything. Once you have the liner in your hand you realize how well they are made and common sense would only tell you that the theory of operation is genius. I surprised more people aren't raving about Mr. Tuffy Ultra Lites. You can't beat the price here either - my LBS (which i always support but didn't have my size) wanted twice the price. Great product - buy don't tell everybody else! No flats yet! And that's a good thing!!! Use in 700 X 23 high end tires. HAve had one flat in a year. Added Insurance for flat prevention. I bought this product to add peace of mind to my bike rides from fear of flat tires. So far so good. They are extremely lightweight, easily installed and very economical considering the downtime and cost of a new tube. I would highly recommend it for all road bike riders.